Billy and Joey in 2015!! Despite not doing much this offseason to improve, in the aggregate, a flawed roster, the Reds are poised to head once more into the breach, dear friends, in 2015. If they are going to succeed in spite of their flaws, then they'll need to maximize the production they receive from each roster spot. Most sabermetric studies find that the optimal batting order is between 5 and 15 runs better than the average lineup. Given that the Reds will likely have little margin for error, improving their win total by 0.5 to 1.5 wins is not insignificant. In that spirit, it seems clear that the Reds should fill the top two spots in their batting order with Billy Hamilton and Joey Votto. It's not a stretch to say that Billy and Joey are pivotal players for 2015, with their success ultimately driving the offense. That said, slotting these two together may be a key to maximizing the production of each, as Billy's extreme speed and Joey's extreme plate discipline actually compliment each other extremely well. With the imposing Votto hitting behind him, Hamilton might arguably see better pitches, including more fastballs, though most pitchers already have plenty of reasons to not walk him. With Hamilton on base, Votto might see more fastballs, as pitchers don't want Billy running wild on them, which might help boost Joey's extra base hit total. Votto sees a lot of pitches, which will allow Billy ample opportunities to steal bases. Votto hits from the left side, which arguably allows him to take advantage of the 3.5 hole created when the first baseman is forced to hold Billy on. On average, each higher spot in the batting order will collect 15-20 more plate appearances than the spot that follows it, so hitting Votto in the second spot will get more opportunities to impact the game than if he was hitting one slot lower. Votto seems to have resigned himself to the "fact" that he's no longer a power hitter, so batting him 2nd would not only get him more PAs but also pair his new view of himself with a lineup spot that traditionally de-emphasizes the importance of power. Maybe such a move reduces either fan expectations or Joey's own cognitive dissonance. The emerging power production from Todd Frazier and Devin Mesoraco, along with the addition of Marlon Byrd's power, means that the Reds have better depth in the middle of the order and no longer quite need Joey to be that type of hitter. In short, it seems possible that Billy's elite speed and Joey's elite hitting will provide mutual, backward and forward protection for the duo. On a number of levels, it seems like the best alignment for the two, so I'm throwing my support by a Billy and Joey ticket in 2015! 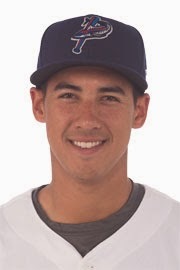 Robert Stephenson ticks just about every box on the "premier pitching prospect" checklist. He has plus-velocity, strong offspeed pitches, good size, and intelligence. However, to date, the sum total remains less than the sum of the individual parts. It just hasn't all clicked into place to reveal a "#1 starter" caliber pitching prospect. The lingering problem with Stephenson is command and control, which makes him inconsistent from start-to-start and occasionally from pitch-to-pitch. In short, Stephenson is not in complete control on the mound. For Robert Stephenson, 2014 was a clear step backward, especially when compared to his "three minor league stop" 2013 season. Stephenson spent the entire 2014 season pitching in double-A for the Pensacola Blue Wahoos. For the Blue Wahoos, Stephenson tossed a career high 136.2 innings in which he posted a 4.74 ERA, 1.38 WHIP, .224 Batting Average Against, 140/74 K/BB ratio, 4.9 BB/9 (12.3% BB%), and 9.2 K/9 (23.3% K%). The jump to double-A is commonly considered the most difficult in the minor leagues and it certainly gave Stephenson his fair share of trouble. The overall numbers mask some stretches where Stephenson was very, very good. It's something of a plus that it was a season of peaks and valleys rather than consistently underwhelming performance. On April 5th, Stephenson started the season on a massive peak, posting one of the most dominating performances in all the minors in his first 2014 appearance. It was technically a relief appearance, as Jonathan Broxton started the game to get in some rehab work. Broxton threw the first inning, then Stephenson took care of the next five. In his five innings, Stephenson struck out 11 batters, gave up 1 hit, walked 1, and gave up no runs. So, of the 15 total outs he recorded and 17 batters he faced, 11 were strikeouts. Furthermore, the process looked exactly as dominant as the outcome. It wasn't a fluke. The hitters were simply overwhelmed by Stephenson and frankly had no chance that day. Unfortunately, the first valley came on April 16th, a game against Montgomery in which he tossed 4.1 innings, gave up 3 hits, 5 runs, and tallied a 3/7 K/BB ratio. Stephenson walked 2 in the first, 3 more in the fourth, and the final 2 in the fifth inning. As easy as he made it look in his first appearance, he made it look equally difficult in this game. He just lost control of the strikezone. That was the type of season it was for Stephenson, but unfortunately the valleys were a bit more prominent and prevalent than the peaks. One particularly worrisome note, Stephenson had three games in which he walked 7 batters! When his command was off, he missed in every direction, but it seemed like he missed both up and up-and-in to a greater degree. One thing I've noticed with Stephenson is that he didn't look quite as comfortable or fluid out of the stretch as he did out of the full windup. 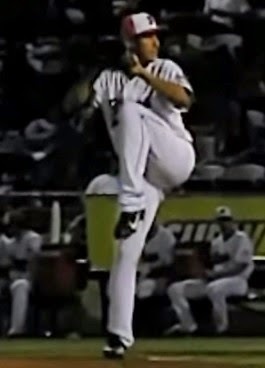 It was difficult to pinpoint and we'll look at it in greater detail in the pitching mechanics section, but the leg kick seemed inconsistent and the delivery more rushed. After noticing that, I thought it would be interesting to see if the stats supported my observation. Now, this isn't a perfect comparison, as he's also climbing the ladder and facing better and more patient hitters in the process. So, there's undoubtedly some of that at work as well, but, over the course of both 2013 and 2014, Stephenson has walked 1.3 more batters per 9 innings out of the stretch than out of the windup, while striking out 0.7 fewer batters per 9 innings out of the stretch than the windup. Again, there's a decent amount of fog in those numbers, but it does support my observation that he doesn't look as comfortable out of the stretch. The fact that the walks, especially in the 7 walk games, seemed to come in bunches also supports the idea that he simply isn't as comfortable or effective out of the stretch. Once the first batter reaches base via the walk, it's more likely that the batters after him will draw the walk. While many pitchers, young and old, probably perform better out of the windup, It's something that bears watching in Stephenson's continued development. Stephenson has good size and athleticism, giving him the look of an impact pitcher. Stephenson stands tall on the mound before beginning his windup. He starts his windup with a small rocker step, allowing him to unweight his right foot and pivot it down onto the rubber. He then brings his left leg up into the leg kick, which, at apex, involves some coil and bringing his knee all the way up to his chest. 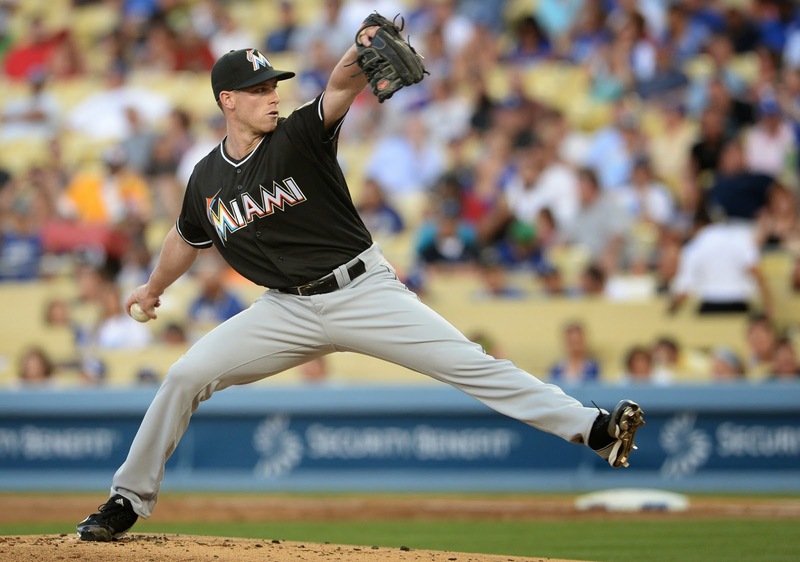 The high leg kick allows him generate maximum force and effectively direct that force towards the plate. At apex, he does a nice job of gathering himself and then utilizes a forward lean to drive to the plate (see photo below). This forward lean is a tilting action that sets the hips in place. 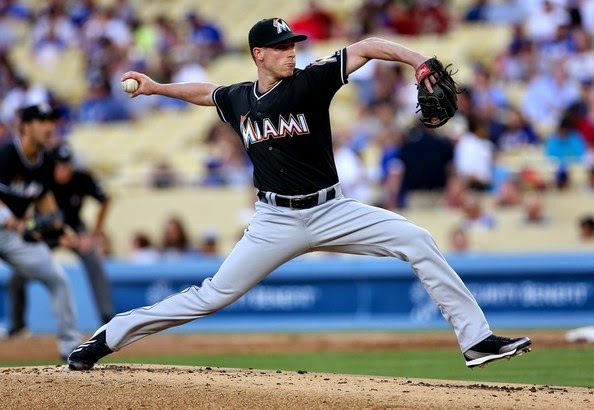 Leading with the hip creates leverage by setting a small uphill angle of the shoulders on the way down the mound. Up to this point, Stephenson's mechanics are very strong. The higher a pitcher loads while remaining in balance, the stronger he will unload. Stephenson is in a very strong position at apex, but his mechanics after apex aren't quite as strong. The first concern on Stephenson is the minimal differential between his hip rotation and shoulder rotation. 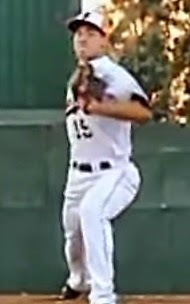 The photo below seems to show the maximum differential in his delivery, by and large the hips and shoulder unwind at similar rates. The lack of differential limits the efficiency of the kinetic chain in both creating force and transferring that force to the baseball. The force that bleeds out of the kinetic chain due to this inefficiency has to subsequently be made up by the arm, which then bears an increased burden. Originally I thought a longer stride would help Stephenson get better and fuller hip rotation, but his current stride length is probably the longest that his athleticism will allow him to effectively utilize, especially in light of my next concern: Extension/Follow-through. Stephenson doesn't seem to get his upper body completely out over his stride leg. The causes and/or effects of which include not having sufficient athleticism to utilize his current stride length, an upper body that remains a bit upright in the delivery, a strange glove-side hand movement, and occasional difficulty in finishing off his pitches. Proper glove-side action involves a number of components, including closing the glove to give the pitcher a firm side to work against in throwing the ball, the glove turning and becoming suspended as the chest thrusts towards it, and the glove finishing in "the box", which is the area between the sternum and the armpit and from the belly button to the waist. In the below photo on the left, Stephenson is close to having his glove in the box, but then drops it down and under as his pitching arm crosses over (as seen in the photo to the right). Ideally, the throwing-side and glove-side should, by mirroring and counterbalancing each other, load the arm for pitching. It's possible that that is occurring here with Stephenson, but it's also possible that his unusual glove movement blocks him off from getting his upper body more effectively out over his stride leg. That might account for his occasional misses up-and-out of the strikezone. As mentioned above, Stephenson isn't as effective out of the stretch as he is out of the windup. This extension/follow-through issue might be the reason. If he doesn't get out over the stride leg quite as well as expected and occasionally struggles to finish off his pitches when working out of the windup, then that's a problem that might only be compounded when working out of a stretch. Stephenson's motion out of the stretch frequently utilizes a lower, quicker leg kick that gives him less time to gather himself at apex before driving to the plate. The lower load means that his unload will be weaker, which arguably means less momentum to drive his upper body out over his stride leg. The more difficulty he has in getting out over the stride leg, the more difficult it will be for him to effectively finish his pitches, resulting in more misses up out of the zone and and up-and-in to the hitter. Stephenson features largely a 3-pitch mix. A mid-90s fastball that can touch 100 mph, but also seems relatively straight. A plus power-curveball that has big, sharp break, which works as both a chase pitch and an in-the-zone pitch. Finally, Stephenson works with an average changeup. Stephenson's repertoire is good enough to project him at the top of an MLB rotation. Of course, he'll need to be able to command it, which is especially true since his fastball relies on velocity rather than movement. I don't love the movement on his fastball or changeup, so the ability to hit his spots will be paramount. In fact, it makes me wonder if he'll eventually need to evolve at the major league level by adding a 2-seam fastball. That said, not many hitters have an answer for a well-located 95-mph fastball, but if it drifts into hitter happy zones, then he'll wish that it had a bit more movement to it. Stephenson has the attributes to be a #1 starting pitcher at the MLB level. His upside is undeniable. However, I've never had him ranked him as the #1 overall prospect on my lists. All of the individual parts of his game are very impressive, but I've had just enough minor questions about each area to make me downgrade him. And, to date, he hasn't yet figured out how to pull together those individual parts in such a way as to become a complete pitcher. Still, the potential is undeniable and if he refines his command, continues to polish his changeup, and improves his performance when working out of the stretch, then it's easy to envision him becoming an elite starting pitcher. Stephenson has some question marks to his game, but his attributes and upside land him comfortably in the #2 slot on the list. After several years of wandering The Middle Path (never going all in to "WIN NOW!" and never tearing things down to reset for the future), the Reds seem poised to continue that journey this offseason. Word leaked out at the winter meetings that the Reds had to slash payroll ($15-17M), giving hope to the fans that the Reds might be forced to actually pick a path. Despite the need to shed payroll, the Reds are still trying to navigate the middle path, winning now and in the future. Whether the Reds can now undergo a rebuild while continuing to compete, a trick more commonly undertaken in more forgiving sports (like the Detroit Red Wings in the NHL) or sports where one franchise player can have a disproportionate impact on the outcome of games (like Tom Brady and New England Patriots in the NFL), remains to be seen. It's a much, much tougher trick to pull in MLB. Whether the Reds can do it depends on the execution of these trades. They must outright win these trades in an era when it's increasingly difficult to do so, because much of the inefficiency has been hammered out of the baseball marketplace. The underlying theory of this trade is sound, so it comes down to the execution. The Reds give up one expensive year of control of a 3-4 win righthanded starting pitcher and a possible compensatory draft pick in exchange for 12+ years of potential combined control over a righthanded pitching prospect and a catching prospect with MLB bloodlines and an above average approach at the plate. There has been a surprising amount of talk about the decline in velocity on Latos' fastball in 2014, but all of Mat's injury problems last year makes it difficult for me to draw the types of conclusions that are being drawn. Is it unreasonable to think that a return to health will see a return of his velocity? The answer to that question may well determine whether the Reds sold high or low on Latos in this trade. In the end, Mat Latos' Cincinnati career has come full circle. A controversial trade brought him into the organization, a controversial trade takes him out of the organization. And, in both scenarios, the underlying theory is sound, it just comes down to execution. So, how DID the Reds do this time? I'm afraid not quite as well as they did the first time. The key piece to the deal was Anthony DeSclafani. Right out of the chute, DeSclafani takes the title for worst name on the 40-man roster. A brutal blend of consonants and dissonance. Others in his life must have struggled with it, because someone bestowed upon him the nickname of "Disco." When the trade went down, I went back and watched all five of Disco's starts for the Marlins in 2014. I watched those starts cold, without any prior research, because I wanted a clean first impression. I don't know if his veins were coursing with adrenaline as a result of making his Major League debut, but his fastball was popping the mitt, averaging 94.4 mph. That level of velocity, when coupled with an above-average slider, was enough to confound the Dodgers. The one changeup that he threw was not a good one, getting hammered by Yasiel Puig for a double. Not only was the outcome bad, but the arm action he used on the changeup looked materially different than the one he used on his fastball and slider. So, the deception was poor, which isn't a good sign going forward. Well, first and foremost, his fastball is vastly more interesting and effective when it sits 93/94/95 than when it sits 91/92/93. Unfortunately, the latter is more common than the former. As for pitching mechanics, Disco's are good without any obvious red flags. His balance and tempo remain strong throughout. His leg kick comes up well past parallel at the apex and he stays over the rubber to effectively gather himself before driving to the plate. The defining characteristic of his mechanics is his stride. After he unpacks his leg from the apex and strides forward, he actually straightens out his front leg, leaving him in an unusual position. While the stiff stride leg looks unusual, it serves to effectively lengthen his stride, which can increase the force generated by the kinetic chain and allow for easier and more complete clearing of the hips to transfer that force to the baseball. For Disco, straightening the front leg seems to serve the same purpose, maximizing the stride length, as Tim Lincecum's "step over the banana peel" move at the very end of his stride. I'm a big proponent of a lengthy stride, as it has real kinetic chain benefits. However, one of the things I like most about the longer stride is that it allows for a greater differential in hip rotation and shoulder rotation. A delayed shoulder rotation allows the pitcher to more effectively throw with his entire body, reducing stress on the pitching arm. Disco has a solid differential (photo below), even if it isn't quite all it could be. As a result, his kinetic chain is effective, but isn't quite as efficient as it might be, potentially reducing the generation of force and/or increasing the effort required to generate that force. Overall, Disco's mechanics are strong, but for a pitcher whose stuff is straddling the line between starter and reliever, any added or lost force might make a substantial difference in career path. 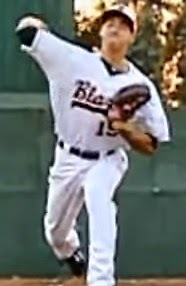 As for his arm action, he throws from a high three-quarter arm slot, maintains good position relative to his shoulder, uses good pronation, and has a solid deceleration phase. All of which should work to minimize his injury risk. Given his inconsistent velocity and weak changeup, it's difficult to see how Disco can find consistent success in the starting rotation. And, it's difficult to see how the Reds can win this trade if he's relegated to the bullpen. The performance against righties certainly isn't great, but the performance against lefties is truly ugly. In light of his limited repertoire and struggles against lefties, a move to the bullpen might be inevitable unless he can either significantly improve his changeup or increase his fastball velocity, neither of which is all that likely. I like Disco's mechanics, but unless he has more and better stuff in his arsenal, it's difficult to see him emerging as an impact pitcher. The best thing about Wallach is that the Reds seem to have prioritized acquiring more disciplined hitters. The organization has been short on on-base percentage and hitters who control the strike zone for far too long. At least they seem to have identified the problem. Wallach isn't a highly regarded prospect, but he fits the Ryan Hanigan/Tucker Barnhart offensive profile. He's not on their level defensively, but he controls the zone well enough and has a solid enough hit tool to have some offensive upside. Of course, as with Hanigan and Barnhart, the margin for error is slim and his ceiling isn't very high, but he's an interesting bat. Wallach isn't a bad second piece in the deal and if things break right he could generate some positive value. Still, his ceiling isn't very high and he has a fairly long development road to travel to get there. Overall, the trade is right in principle, but questionable in execution. On one level, it's impressive that Walt was able to deal Latos after his injury plagued season and offseason, but on another level the return for his services feels light. 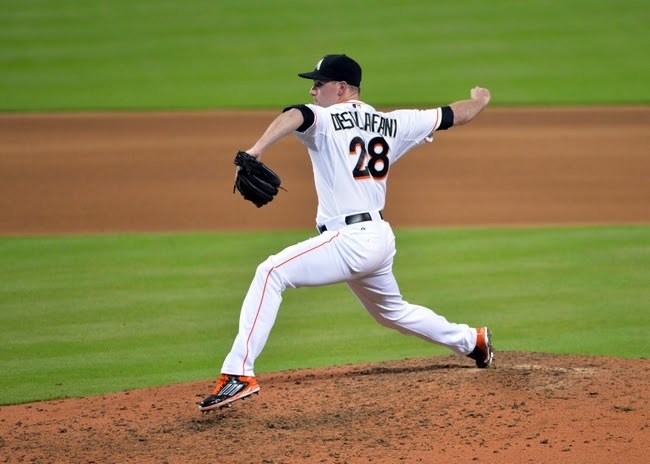 Ultimately, the deal hinges on DeSclafani and his ability to effectively hold down a rotation spot in Cincinnati. However, his velocity as a starting pitcher seems inconsistent at best and insufficient at worst, while his changeup really needs to develop to help him neutralize lefties. Given the cost to obtain him, DeSclafani will undoubtedly get ample opportunity to prove he can be an effective starting pitcher. In the end, it's surprising that the return for Lato wasn't higher and the trade to bring Latos into the organization seems better than the one that took him out of it. Jesse Winker has a chance to be a very special hitter. That possibility exists, in large part, because he possesses the most important attribute in hitting. Football genius Bill Walsh once defined "functional intelligence", which he viewed as the big key to success at the quarterback position, as follows: "[t]he ability of a player to organize and isolate different categories of tasks that he must perform in a particular situation is commonly referred to as functional intelligence. This ability is the key to being able to instantly process information in highly stressful situations." The more and more I consider hitting, the more convinced I become that the most important component of hitting is the capacity to absorb and process meaningful information. Hitting is just like playing quarterback, the ability to process information being the most is the most important attribute of both. Jesse Winker has that ability. A tremendous amount of it. "[Hitters] pick up on cues from the [pitchers'] bodies before their pitch. So for a pitcher, without knowing it, the hitters are actually focusing in on the motion of the pitcher's shoulder and the pitcher's torso and hand. And then, as soon as the ball is released, [hitters focus] on what is called the flicker, which is a flashing pattern that the [ball's] red seams make as they rotate. And it's only picking up those anticipatory cues that allows the hitter to hit the ball." Hitters like Pujols couldn't read the unfamiliar, underhand motion and arm action cues of Jennie Finch. 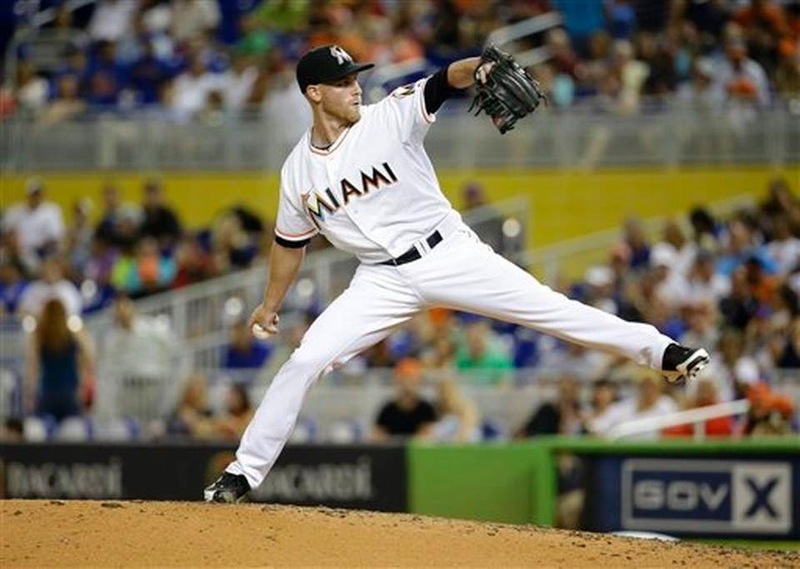 They can, however, after much experience and practice, read the pitching motions and cues of pitchers like Clayton Kershaw and Justin Verlander. This ability reveals itself in Jesse Winker through his calmness at the plate. He looks very comfortable in the box simply tracking pitches. He looks calm because he can process information very quickly, allowing him to recognize pitches and effectively control the strike zone. Jesse Winker is in complete control at the plate. 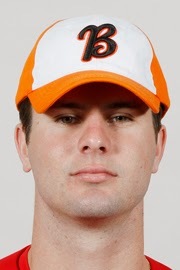 Jesse Winker had an up-and-down age 20 season. He split his time between destroying high-A pitching for the Bakersfield Blaze and scuffling against double-A pitching for the Pensacola Blue Wahoos. He missed a couple of weeks with a concussion after colliding with an outfield wall in high-A and suffered a broken wrist after his promotion to double-A before rebounding in a dominating turn in the Arizona Fall League. For the Blaze, Winker hit a robust .317/.426/.580/1.006 with a 16.1% BB%, 18.5% K%, and 13 homers in 249 PAs. The ballpark in Bakersfield is notoriously hitter friendly, but it was a dominating performance by Winker nonetheless. In this day and age, it's worth noting that Winker missed a couple of weeks with a concussion, but fortunately it didn't seem to affect him upon returning to the lineup, as he went right back to earning his promotion to double-A. For the Blue Wahoos, Winker found things a bit more challenging. He posted a slash line of .208/.326/.351/.677 with a 15.2% BB%, 23.9% K%, and 2 homers in 92 PAs. It felt like his ABs were still high quality and his balls-in-play were pretty solid, so there might have been a bit of poor hit luck at work in his uninspiring numbers. Regardless, he likely would have improved on those numbers, but his season was cut short by an injury sustained in a car accident. In the accident, Winker suffered a partially torn tendon in his right wrist. To make up for lost development time and to end the season on a positive note, the Reds sent Winker to the Arizona Fall League. For the Surprise Saguaros, Winker got right back on the hittin' track, posting a familiar looking line of .338/.440/.559/.999 with 16.7% BB%, 20.2% K%, and 3 homers in 84 PAs. Most importantly, he had no lingering issues with his concussion or wrist. In addition to consistently strong walk rates and the ability to control the strike zone, Winker also flashes power to all fields. Given that the biggest concern on Winker's offensive game revolves around his power production, it's very encouraging that he is already flashing opposite-field power. If you look at Winker's 2014 spray chart, then you can see that he hit four of his homers to leftfield. In addition, for the Blue Wahoos he was robbed of a homer by a jumping leftfielder and also hit a homer that just twisted left of the leftfield foul pole, so he could easily have added two more opposite field homers to his 2014 tally. In light of his opposite-field power, it's interesting that Winker has a tendency to pull ground balls, but he does so to such an extent that he even saw a few infield shifts with Pensacola. He obviously has the ability to hit to all fields, so the pulled ground balls may speak to a tendency to "roll over" outer-half offspeed pitches. This tendency feels like it could be corrected, if necessary, by a small tweak in approach, rather than requiring any type of serious mechanical overhaul. On the downside, Winker's impressive approach didn't always hold up at double-A, where the caliber of opposing pitchers was significantly higher. On a few occasions, Winker took two fastballs for called strikes and ultimately ended up flailing away at a 2-strike breaking ball out of the zone for the strikeout. Obviously, giving away count-leverage like that is atypical of his overall approach and was probably the result of struggling to adjust to more talented opposing pitchers. It doesn't strike me as a long-term concern, rather simply the need to continue making refinements to his stellar approach as he logs more Plate Appearances and sees more advanced pitches. That's just another example of how complete of a hitter Jesse Winker is, lefties don't give him any trouble. The best swings generate maximum functional force without losing control over that force. The best swings are a combination of quick/compact and powerful. Sacrifice too much force for control and you won't be an impact hitter. Sacrifice too much control for force and you won't be able to consistently put the bat on the ball. The best swings find and strike the right balance between the two. 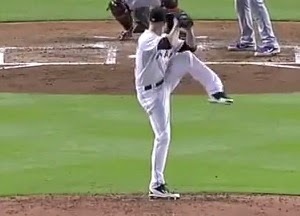 In his pre-pitch stance, Winker uses a conventional setup with a slightly wider than shoulder-width stance and hands held just above shoulder-level. Winker's stride is a one-piece, leg kick type stride that operates as a timing mechanism and allows him to get his weight into his back hip. He lifts his front knee and draws his front foot back before taking a sizable stride forward. 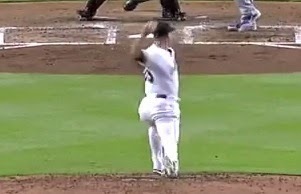 As he strides, Winker simultaneously loads his hands, using a fairly small movement to load up, dropping his hands down to shoulder-level while drawing them back slightly. 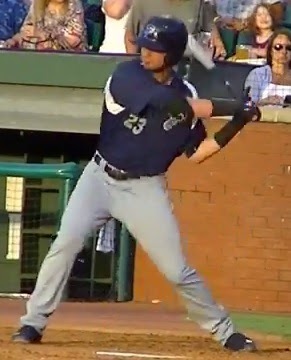 The starting position of Winker's hands combined with the load occasionally gives Winker's swing the appearance of an arm-bar, as his lead arm reaches almost full extension. However, as demonstrated by Todd Frazier (proud owner of a more extreme version), the arm-bar isn't an issue if you can make the needed in-swing adjustments to properly handle the inside pitch. And, despite the slightly deeper hand position, Winker manages to still be short and quick to the point of contact. Winker effectively drops the back elbow into the back hip, syncing the upper body and arms to the rotational power generated by the core. Once he drops the back elbow into the back hip, the firing of the hips powers the swing and that core rotation ultimately delivers the swing to the pitch. Winker also does a nice job of firming up the front side, which anchors the swing and allows the generated force to both rotate effectively around the body and efficiently transfer to the swing. Overall, Winker has a smooth, balanced swing that generates good power and that he can control to generate consistent contact. It's an aesthetically pleasing, and highly productive, swing. He's a pure hitter. Obviously, since that swing produced a long home run, it's not something that hampered him, but it's unusual and interesting to note. I suspect it's a small, on-the-fly adjustment related to his slight arm-bar and also wouldn't be surprised if leaking to the first base side also explains his tendency to hit ground balls to the right side. If he's leaking towards the first base side to increase his inner half coverage, then he's probably a bit more susceptible on the outer half. Of course, Winker has the type of ability (both mental processing of information and physical ability) to effectively cover both sides of the plate, but he might have to refine his approach a touch as he climbs the ladder. It's difficult to stay on-and-through an outer-half pitch in order to drive it to the opposite field if your body is leaking in the opposite direction. So, it probably bears watching as he faces increasingly better pitchers who can consistently work to both corners of the plate. Overall, Winker is a very fundamentally sound hitter. 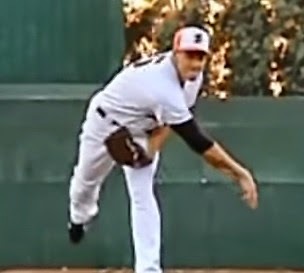 He generates very good force with his body rotation and efficiently transfers it to the baseball. He has the hand-eye coordination necessary to consistently get the barrel of the bat on the ball, which ensures hard contact. And, he processes the information necessary to identify pitches and control the zone. All of which adds up to a complete hitter who generates (1) power, (2) batting average, and (3) on-base percentage, respectively. Not too shabby. 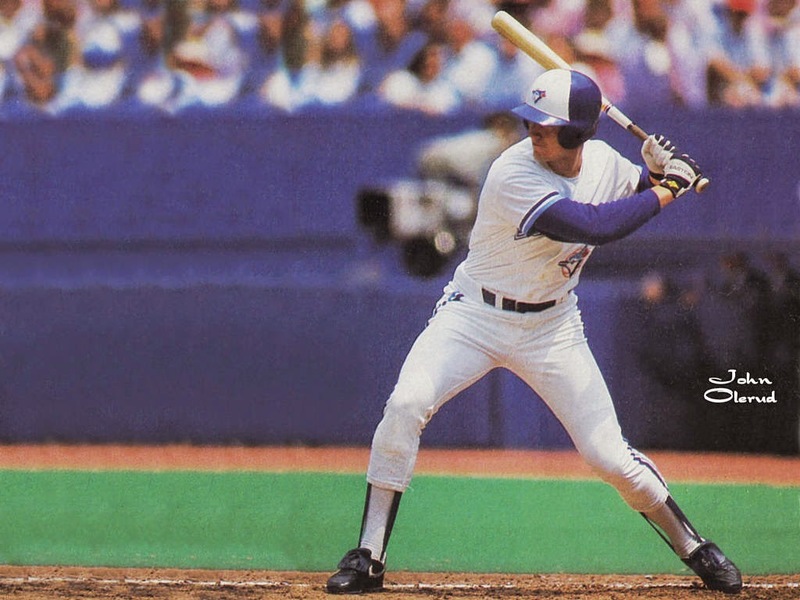 It's a swing that gets to the hitting zone quickly and stays there a long time. There isn't a ton to say about Winker's defense and running, as they aren't areas of strength. His hit tool is clearly his carrying tool and what drives his value as a prospect. That said, I think Winker is a bit underrated on defense. Winker isn't a burner, but he has some athleticism and has made a number of good diving catches. He's unlikely to have plus-range, but I suspect it'll be a bit better than many expect and he'll make all the plays he can reach. His arm seems solid-average in terms of both strength and accuracy. On the bases, Winker is limited by his underwhelming foot speed, but he's a smart and opportunistic baserunner who will steal or take the extra base when the opportunity presents itself. Overall, these areas aren't going to be value-drivers for Winker, but I don't think they'll act as real drags on his value, either. I haven't checked any other lists, but the sense I get is that Jesse Winker is still a bit underrated. Winker's pure hitting ability is rare and valuable in-and-of-itself, but when you factor in the declining offensive environment around Major League Baseball, it's difficult to see how Winker isn't one of the most valuable and promising prospects in all of baseball. Other prospects may have more value-drivers, but it's difficult to imagine many better prospects from purely a hitting perspective. In the book Moneyball, someone in the A's organization floated the notion that prospect Mark Teahen "could be another Jason Giambi." Obviously, hindsight frequently does violence to prediction, but I'll go out on a limb here and say that Jesse Winker could be another Joey Votto. For now, he has to settle with being the #1 prospect on this list.